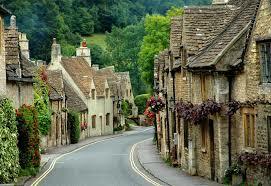 Let your tour guide take you from Bath to the pretty villages in the Cotswolds. Forty minutes drive and we reach the lovely village of Castle Combe. The 14th Century Market Cross is of considerable local importance – reflecting the significance of the cloth industry. 2)Bibury – the most beautiful village in England according to William Morris, an eminent poet,designer and artist. 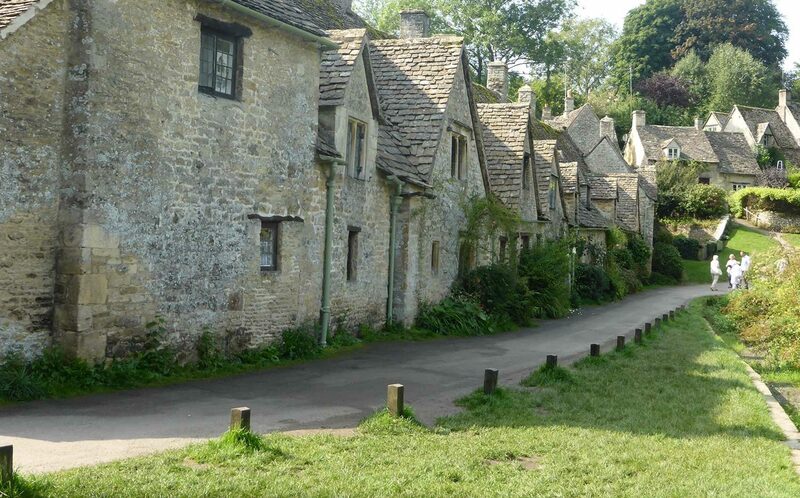 No sightseeing tour to the Cotswolds is complete without visiting Arlington Row in Bibury. The 14th Century monastic woolstore has been converted into individual dwellings. Some of the doors indicate how small some of the inhabitants were. So the Romans built structures in Bath. They also built luxurious villas in the depths of the Cotswolds! Further evidence of Roman occupation of the Cotswolds can be seen in Cirencester – ‘The Capital of the Cotswolds Top five things to do in Cirencester. 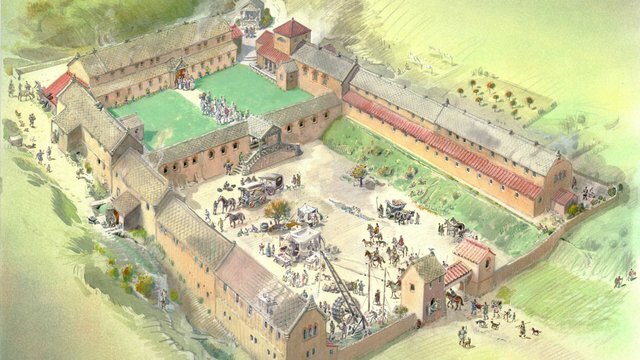 Between 100 – 150 AD the Romans built a Basilica /Forum complex , a theatre and an Amphitheatre holding 8,000 visitors. Much of the Roman history is exhibited in the award winning Cirencester Museum, including a unique Hare design mosaic floor. No Cotswolds day tour from Bath would be complete without visiting the delightful villages of the Slaughters. Lower Slaughter is totally unspoilt and is a traditional Cotswold village. The only nod to commercial activity is the restored 19th century flour mill. The most noteworthy part of Upper Slaughter is the square of cottages, that were reconstructed by the famous architect Sir Edward Luytens in 1906. We travel south alone the Roman Road ( the Fosse Way) to reach Northleach – a town celebrated across Europe as a major centre for the Cotswold Wool Trade. St. Peter and St. Paul’s Church. The most important site is that of the 15th Century Wool Church of St.Peter and St. Paul. It was built with the wealth of the woolmerchants. The Cotswold Stone used to build the church came from the town’s quarry – now the Market Square. The wealthy woolmerchants are remembered with memorial brasses set out on the church’s floor. Some of these woolmerchants are shown to stand on woolsacks and sheep to emphasize the source of wealth. Tetbury is our next destination. The town centre is dominated by the splendid pillared Market House built in 1655. 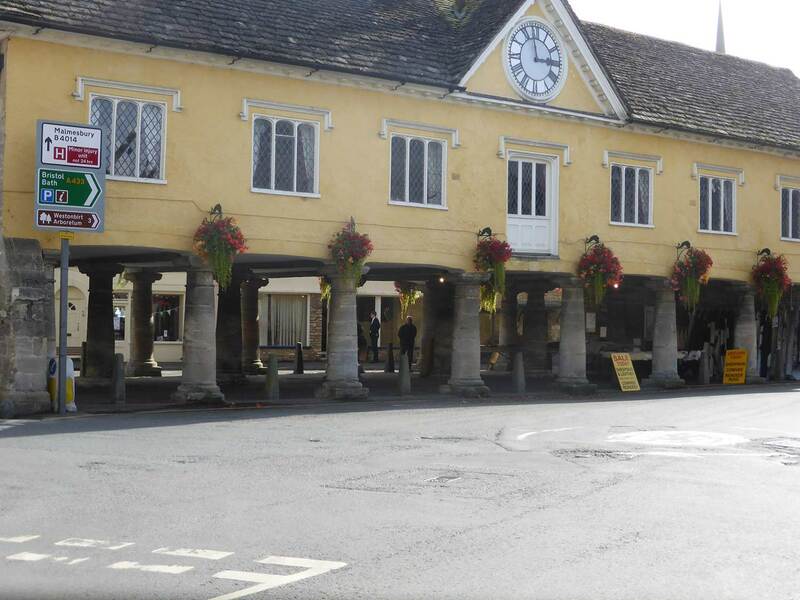 Tetbury is an architectural gem with many of its woolmerchant houses the same as they were 300 years ago. There are many fine Antique Shops. Also there is the Highgrove Shop run by Prince Charles’ Trust – well worth a visit! Several shops also hold the Royal Warrant and display the Prince of Wales feathers. Prince Charles has lived at Highgrove for over 30 years now.Since 1980 the house and the gardens have undergone many thoughtful and innovative changes.Today after much hard work the garden unfolds into a series of highly personal and inspiring areas.The opportunities to see the gardens include tours, Champagne Tea tours as well as a Garden Tour and supper.